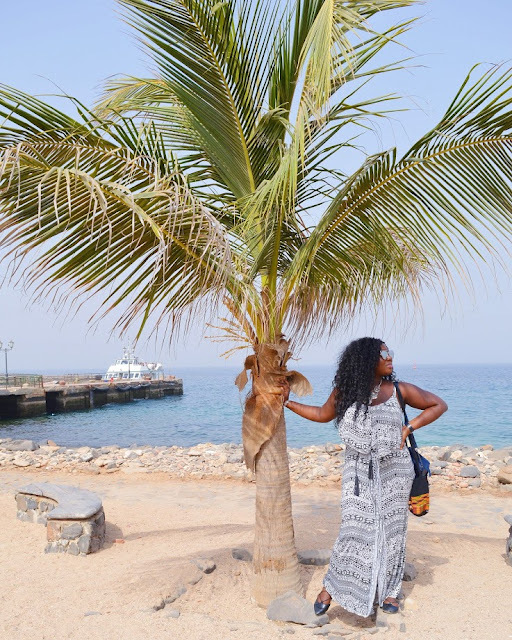 Today I will be sharing with y'all another travel diary edition covering my visit to Goree island in Dakar Senegal last December. 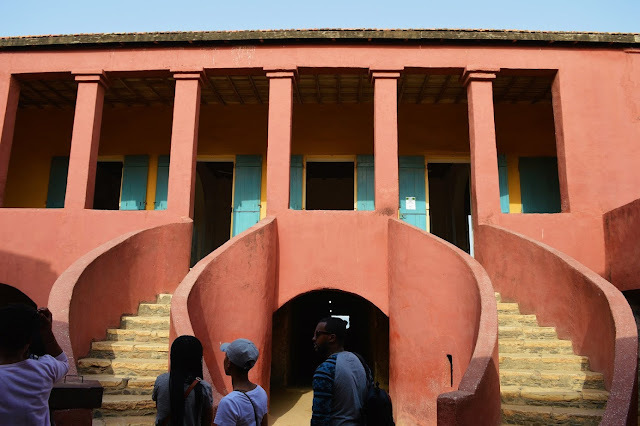 Goree is one place I have always wanted to visit due to my large interest in African History. 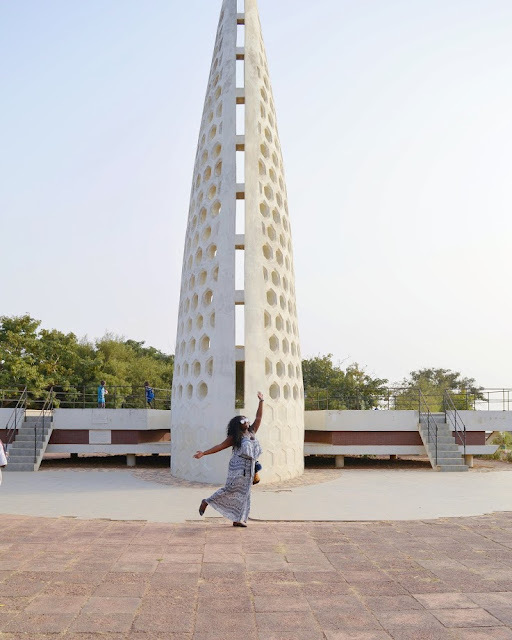 Therefore, once I knew I was traveling to Senegal, Goree was the first place I made arrangement to go visit. 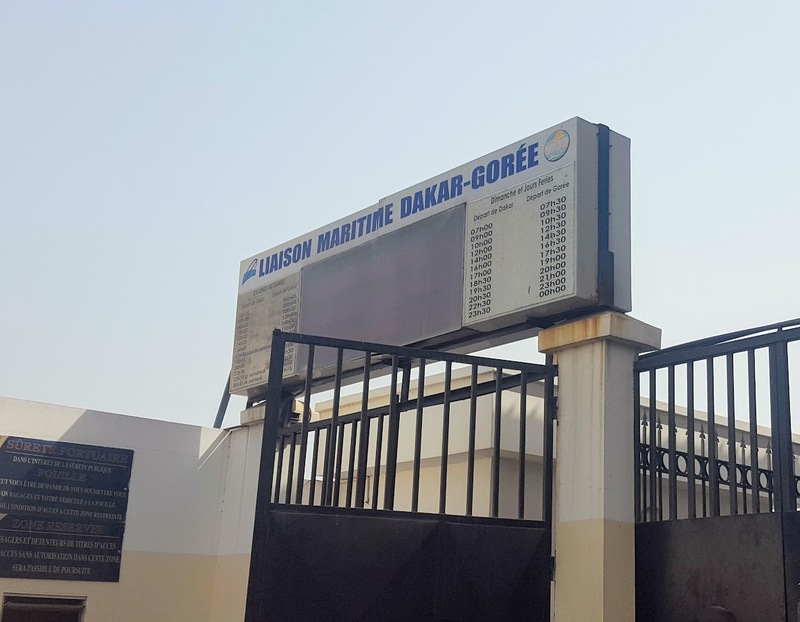 Goree Island is just off the coast of Dakar so getting the requires a short ferry ride. We arrived at the ferry docks quite early in the morning and there was already a long line. The island is one of Dakar's main tourist sites, therefore this was understandable. Basking in its beauty upon arrival! 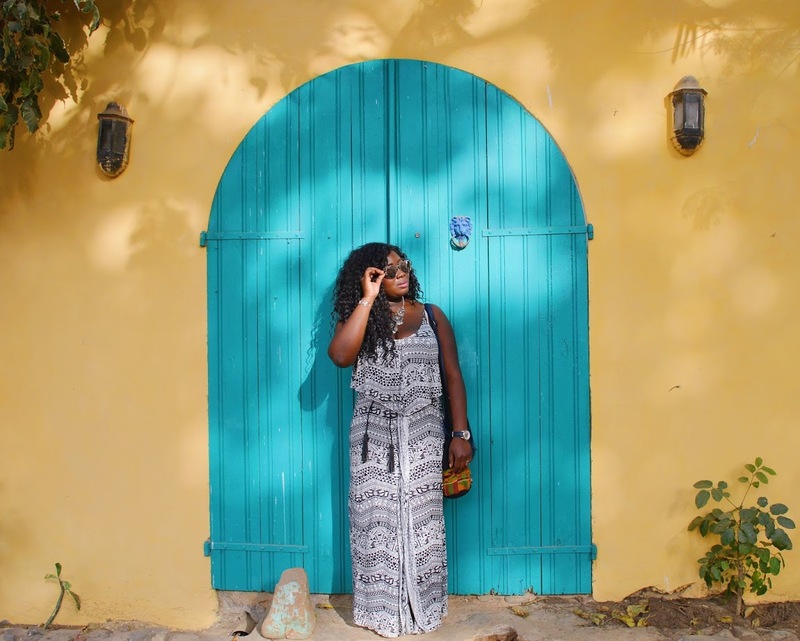 My first impression was that, Goree had very beautiful scenic views and cute colourful architecture. 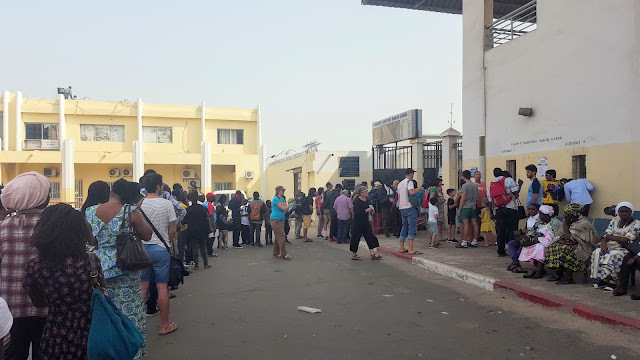 Once we disembarked from the ferry, there was a large group of tour guides awaiting those coming of the ferry to offer their tour guide services. It was quick and easy to select one, so once that was done off we went to explore Goree. Our tour guide led us around the island and provided us with cultural and historical information about Goree and its people. 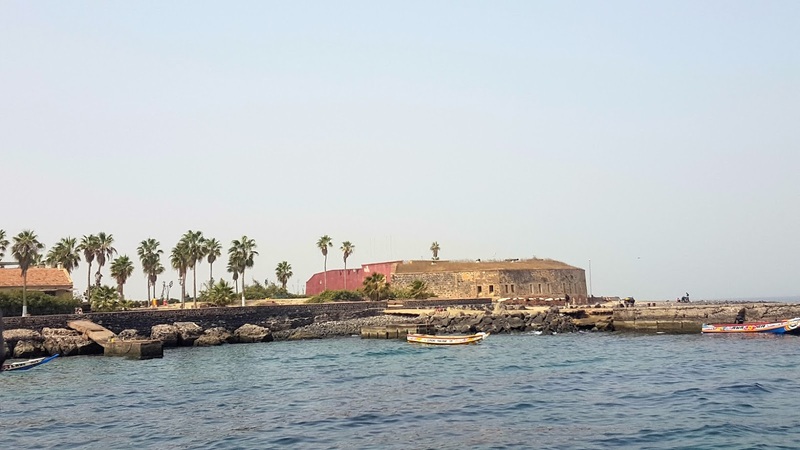 Goree Island is the main home to Senegal history within the trans-atlantic slave trade. 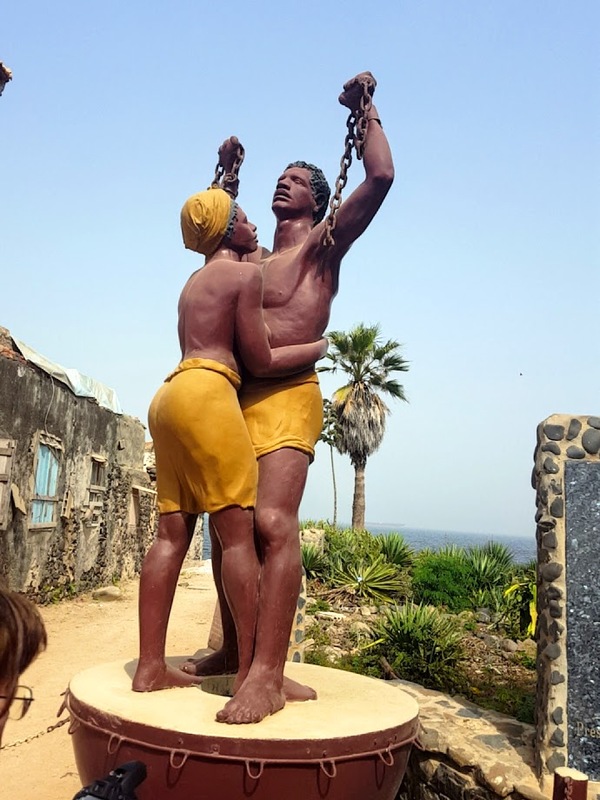 This is embodied in the islands Goree Slave House 'Maison des Esclaves'. I have visited the Elmina slave castle in Cape Coast, Ghana, therefore I was very interested to see the one in Goree as it is also another major African structure part of slavery's history. 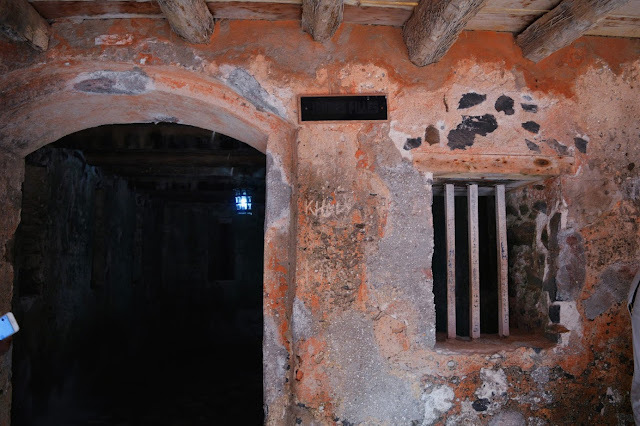 Inside 'Maison des Esclaves' we are met with historian who provided us with the history of the slave trade on Goree, how the trade was carried out as well as information about the atrocities that took place within the slave house. It was very sad as well as angering to here all that took place. This was a very eye opening experience and also intense emotionally to be standing in, touching, seeing and even breathing in all the horrible things that occurred there. 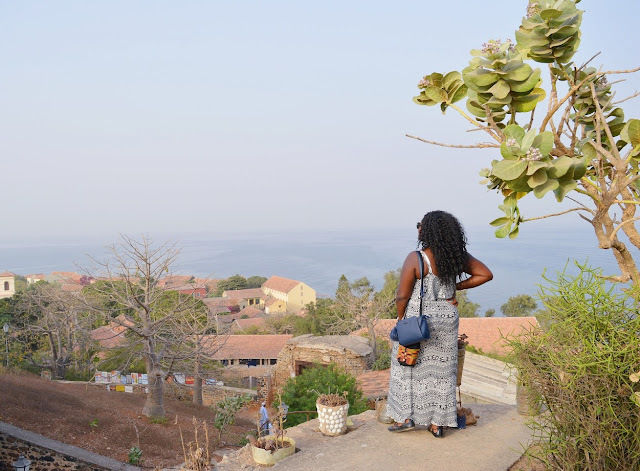 After visiting the Goree slave house, we continued to explore the reminder of the island to see the beautiful views, architecture and art it had to offer. 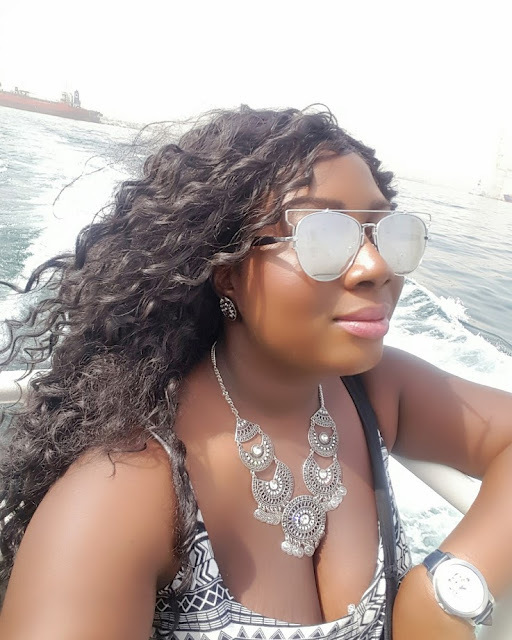 I absolutely loved the vibrant colourful vibe of the island. 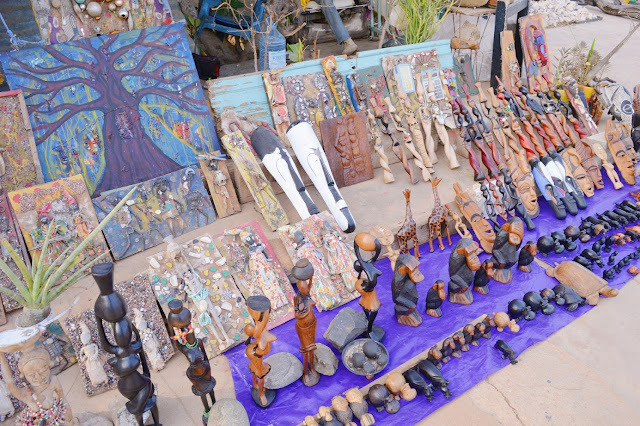 As we explored, our tour guide told us a bit more about the culture of the Goree people. This is the school that a number of future leaders and fathers of African independence attenuated. A few notable people are Felix Houphouet-Boigny the first president of Cote d'Ivoire, Modibo Keita the first president of Mali, Hamani Diori the first president of Niger, Sylvanus Olympio former prisident of Togo and Mamadou Dia the first Prime Minister of Senegal. 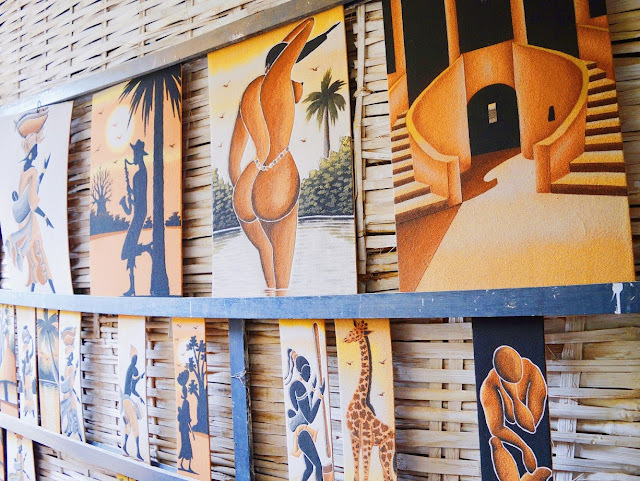 Throughout the island, there was a lot of beautiful art on display and available for purchase. This was not surprising as there many tourist that visit the island, thus it is major part of their economy. We had the opportunity to see a demonstration of how the beautiful sand art pieces are made. 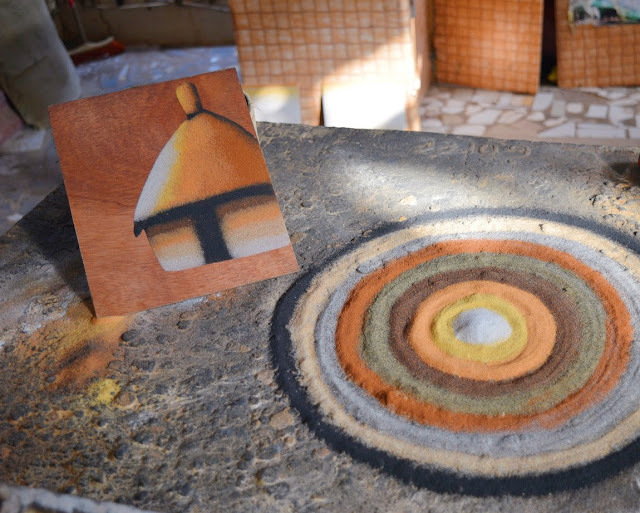 The artist explained that each type of sand used and its color if from the ground of different parts of the continent. There was Senegalese sand, ground from Ghana, ground from Kenya, and sand from the Sahara desert etc. He then demonstrated how they make the house art piece and it was one of the dopest thing I've ever seen! I will share a video of his demonstration on YouTube soon so stay tuned and subscribe to our channel! What a true definition of African art! Although I loved so much of the art I saw, I was not able to get any as I was worried it would not fit in my suitcase plus I already have a large collection of African art at home. Therefore, I wanted to get something different. I definitely could not leave the island without purchasing some sort of souvenir. Aside from Africa art, I have great love for African instruments. Therefore when I came across the instrument this man was hold I was intrigued. It is kind of like a shaker, however there is a very intricate way to play it properly, you do not just simply shake it lol. He proceeded to show me how to hold it and play it, however after many failed attempts I was like 'nawww its all good, lemmie just buy it and be on my way' lol! The struggle was real but I shall perfect it very soon and show y'all :) In addition, I also purchased a beautiful colourful beach wrap from one of the ladies on the island. All this exploration had us work up a hunger, therefore before leaving the island stopped by one of the restaurants for lunch. 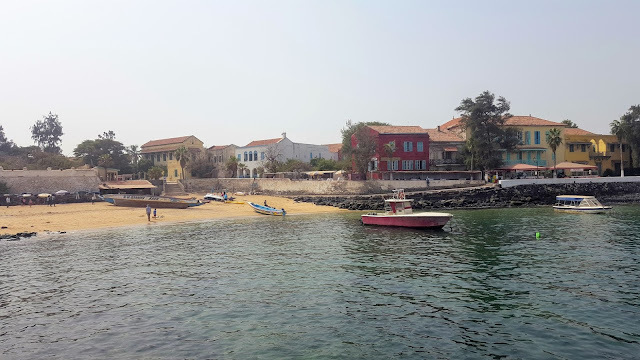 Has a wonderful time exploring Goree island, learning its history, its culture and interacting with its people. Goree is a must see whenever visiting Senegal, therefore I highly recommend you check it out. ...And pssssstttt...you don't need a visa to travel to Senegal. So, just book that ticket and go!